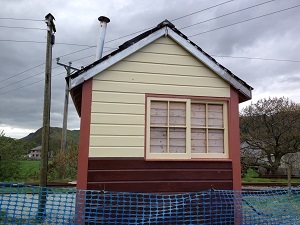 In 2007 a replica of the signal box that was used to control the crossing of the standard gauge by the narrow gauge in Porthmadog was high on the list of the Heritage Group’s ambitions. 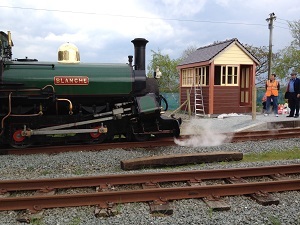 Permission was sought and given for the box to be located in its original position on the north side of the Cambrian and to the west of the narrow gauge. 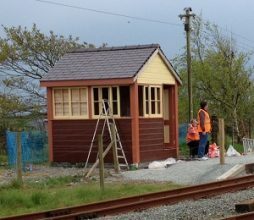 The Heritage Group, as part of its contribution to the Welsh Highland Railway construction project, agreed to raise monies and to co-ordinate the construction of a replica of the Cambrian Crossing Signal Box. This was an ideal opportunity to recreate a very visible aspect of the original WHR scene and to demonstrate the Group’s commitment to both WHR heritage and the project as a whole. 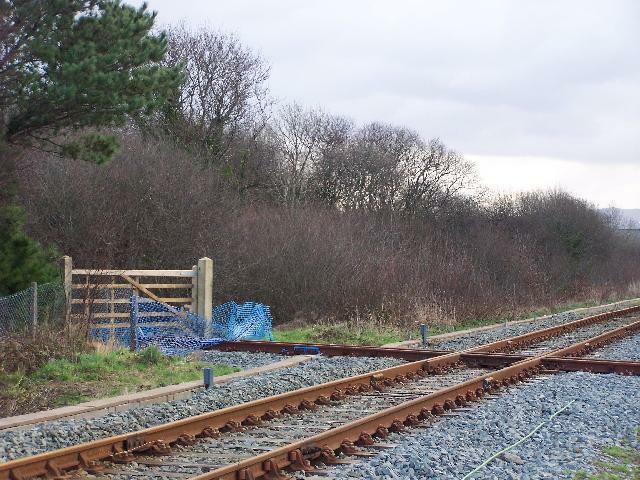 The project was approved and agreed by FR Heritage Ltd., Welsh Highland Railway Construction Ltd, and the FR Company. 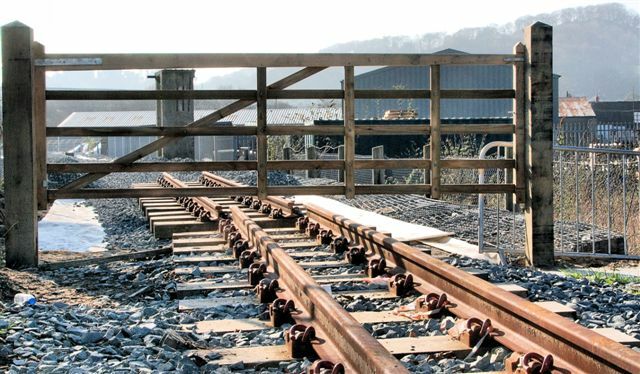 Welsh Highland Railway Construction Ltd put £5,000 into the scheme, while other monies have come from the Heritage Group, from an appeal organised by the Group and from the WHR Society as a whole and the West Midlands branch of the WHRS. 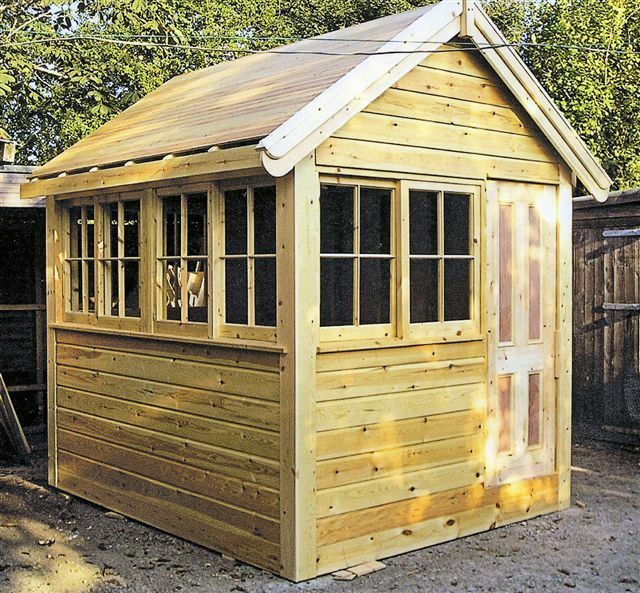 Scale drawings were produced and an order to Buildings Bespoke was placed in late 2007 for its manufacture. Gates at the crossing were insisted on by Network Rail. 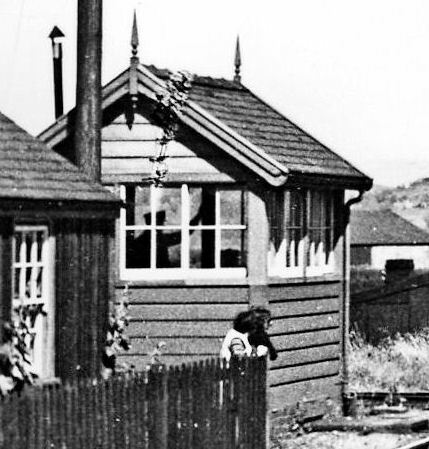 So to enhance the ‘scene’, replicas of the original wooden crossing gates were paid for by the West Midland group of the Society and it was felt that the whole scene could provide passengers with a glimpse into the old Welsh Highland Railway. Unfortunately it did not prove possible to secure the intended location for the box and two alternative options then presented themselves. 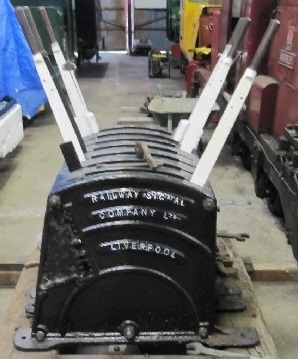 One was to modify the box and to relocate it at Tryfan Junction where there had been a NWNGR box originally, and the other was to locate it at Pen y Mount to house the equipment controlling the junction between the Welsh Highland Heritage Railway and the new WHR ‘main’ line. 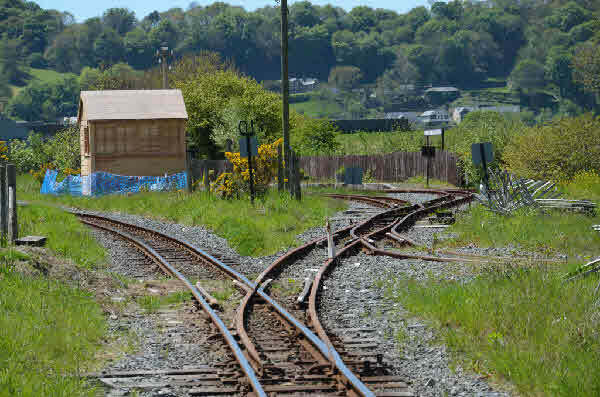 The latter option was preferred, as it could act as an operational box controlling a real junction at a site not too far from the intended location. The major donors were consulted and supported the plan, albeit with a degree of disappointment. 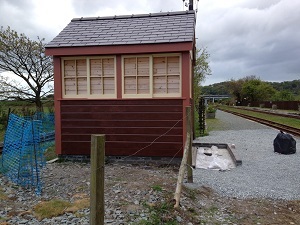 After spending some time in storage at Dinas, the box was finally erected at Pen y Mount in May 2013 and subsequently roofed in slate. In May 2014 it was painted by the West Midlands Group of the Society in light stone, dark stone and maroon brown (as the GWR called the colours). 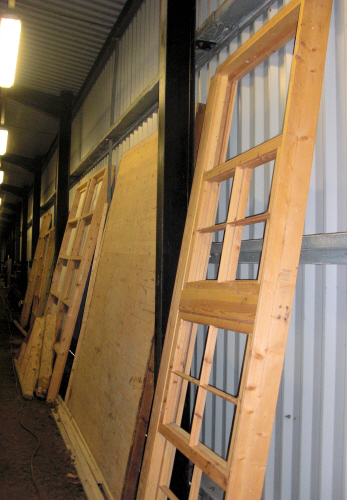 A 7-lever frame was supplied by the Ffestiniog Railway Company for use in the signal box and it was refurbished in the WHHR workshops. The mechanical interlocking was modified for its new role. 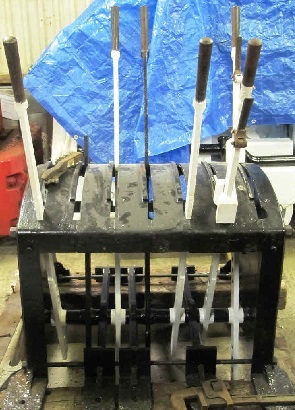 Five of the levers will be used initially. Three will operate the points and the approach signals from the two directions respectively. Two further levers will each lock the frame until released by separate keys for the two lines. Work to fit out and finish the box was under way in Autumn 2015 under the leadership of Michael Hadley with the assistance of the West Midlands Group of the WHRS. 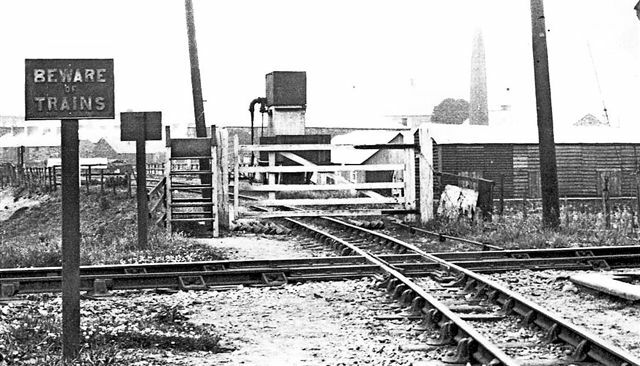 The original gate from the 1930’s taken from the northern edge of the GWR track, looking back to Portmadoc New. 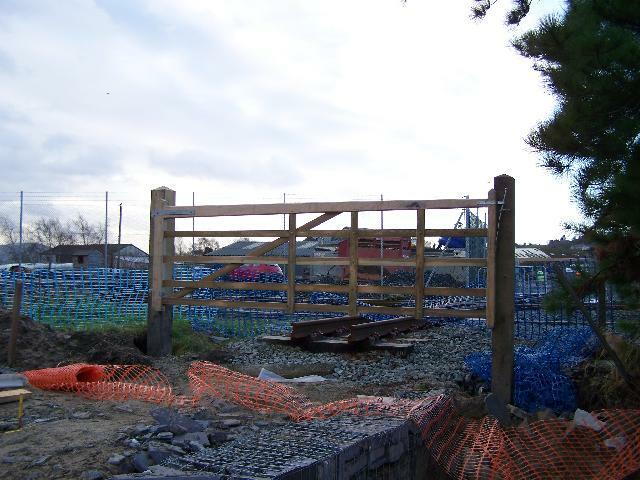 The new northern gate shortly after erection during early construction work. Taken from the proposed site of the new crossing box. The new northern gate shortly after erection during the early construction work. 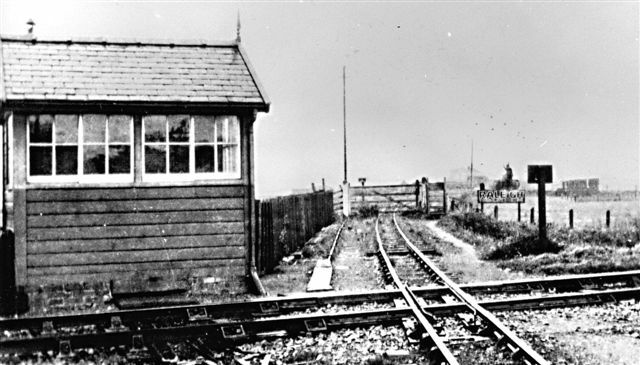 The proposed site of the crossing box is to the immediate left of the gate. August 2016. Sadly the box has failed to withstand the rigours of the Welsh climate and extensive repairs have been needed. 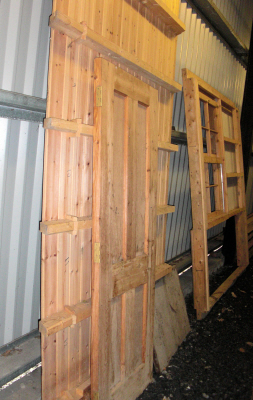 Most of the shiplap cladding is to be replaced and a new exterior door is needed. Much of the work on site is being carried out by two volunteers, Lyndon Cooper and Steve Broomfield. The timber is being prepared by the West Midlands Group.